In this photo, WGS-4 launches on a United Launch Alliance Delta IV vehicle at 7:38 p.m. Eastern time from Cape Canaveral Air Force Station. CAPE CANAVERAL, Fla., Jan. 19, 2012 -- Boeing [NYSE: BA] has received the first on-orbit signals from the fourth Wideband Global SATCOM (WGS) satellite it is delivering to the U.S. Air Force. The signals indicate that WGS-4, the first in the Block II series, is healthy and ready to begin orbital maneuvers and operational testing. 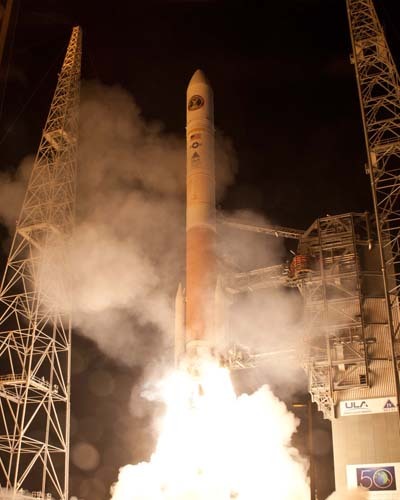 WGS-4 launched on a United Launch Alliance Delta IV vehicle today at 7:38 p.m. Eastern time from Cape Canaveral Air Force Station. Controllers confirmed initial contact with the spacecraft 58 minutes later at 8:36 p.m. Eastern time at a ground station in Dongara, Australia. Boeing's Mission Control Center in El Segundo, Calif., confirmed that the satellite is functioning normally. "WGS-4 continues Boeing's commitment of supporting the Air Force's mission of delivering critical communications to warfighters," said Craig Cooning, vice president and general manager of Boeing Space & Intelligence Systems. "The company will remain focused, committed and dedicated to this mission as we continue to build the WGS series of satellites." Following a sequence of orbital maneuvers and on-orbit tests, WGS-4 will be placed into geosynchronous Earth orbit. The satellite joins WGS-1, which entered service over the Pacific Ocean in April 2008; WGS-2, which began operations over the Middle East in August 2009; and WGS-3, which entered service over the Atlantic Ocean in June 2010. Together, the four WGS satellites will provide assured access to high-data-rate, jam-resistant communications for U.S. forces and allies around the world. The Block II series includes additional capabilities, such as a new radio frequency bypass that supports the transmission of airborne intelligence, surveillance and reconnaissance imagery at data rates approximately three times greater than those currently available on Block I satellites. All WGS satellites are built on the proven Boeing 702HP platform, which features highly efficient xenon-ion propulsion, deployable thermal radiators and advanced triple-junction gallium-arsenide solar arrays that enable high-capacity, flexible payloads. The WGS communications payload has unique flexibility that is important to the military, as well as the ability to interconnect terminals that operate in different frequency bands and to reposition coverage beams based on evolving mission needs. WGS supports missions including tactical communications to and between ground forces, and relaying data and imagery from airborne intelligence, surveillance and reconnaissance platforms.